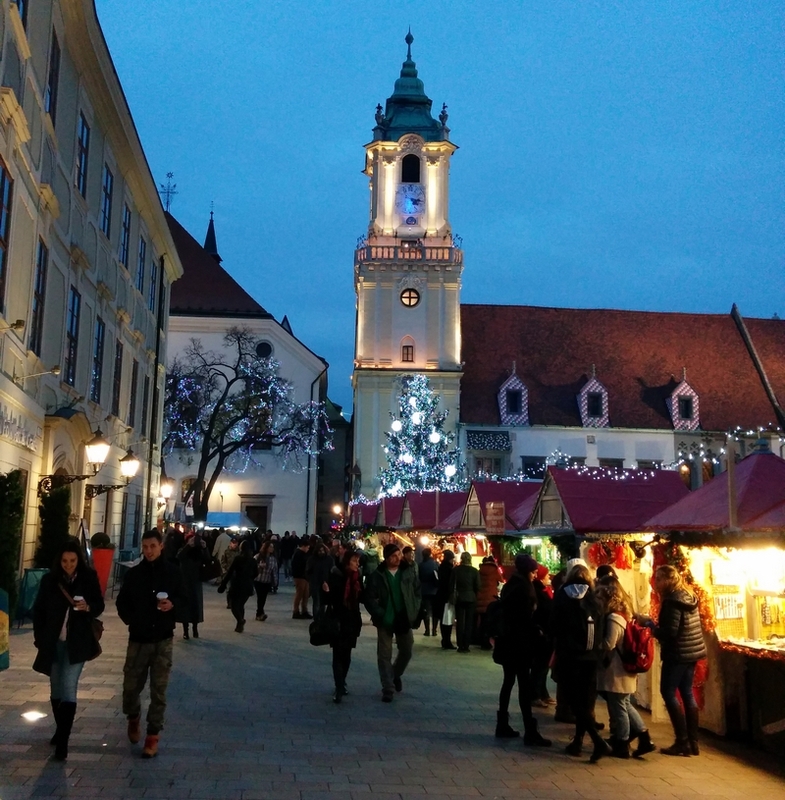 Just like in lots of other European capitals and cities, Bratislava also has its own beautiful Christmas markets. 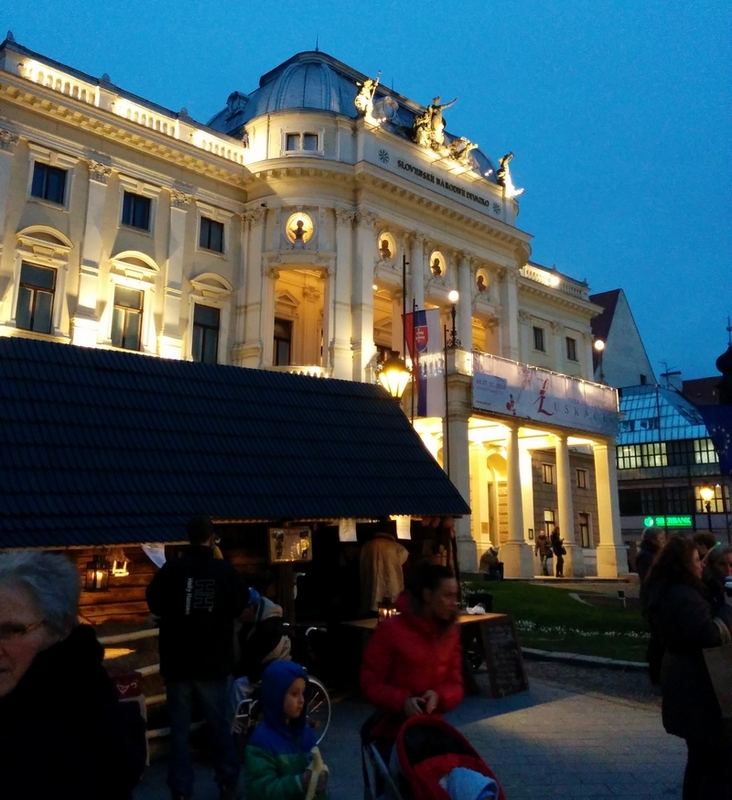 They are getting better and better for every year passing by, so if you look for a Christmas market not yet among the most famous, but with a really nice Christmas spirit and atmosphere, go to Bratislava. 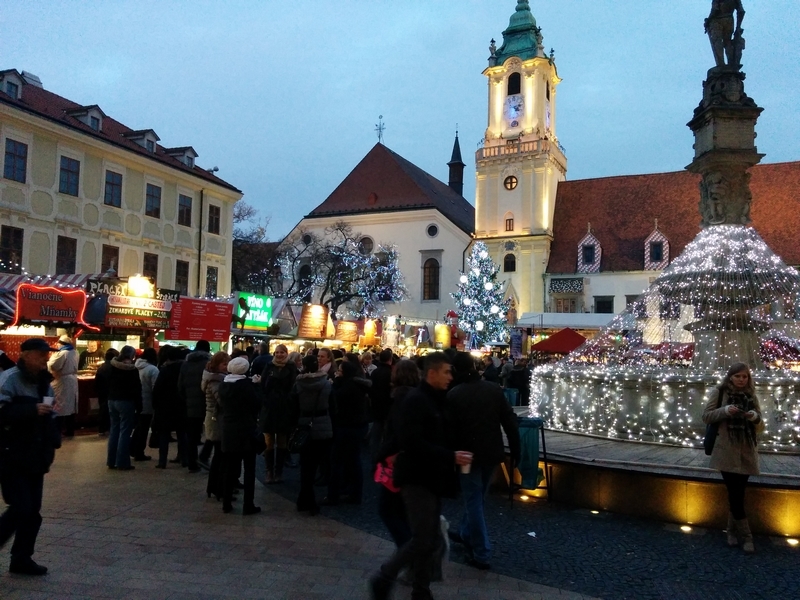 In Bratislava there are two big Christmas markets in the very heart of the city, only a few hundred metres away from one another, meaning that you will easily walk from one to the other, and then back to the first one again easily. Along the way you will see some of the cool statues located around in the city centre of Bratislava, making it a really enjoyable walk. 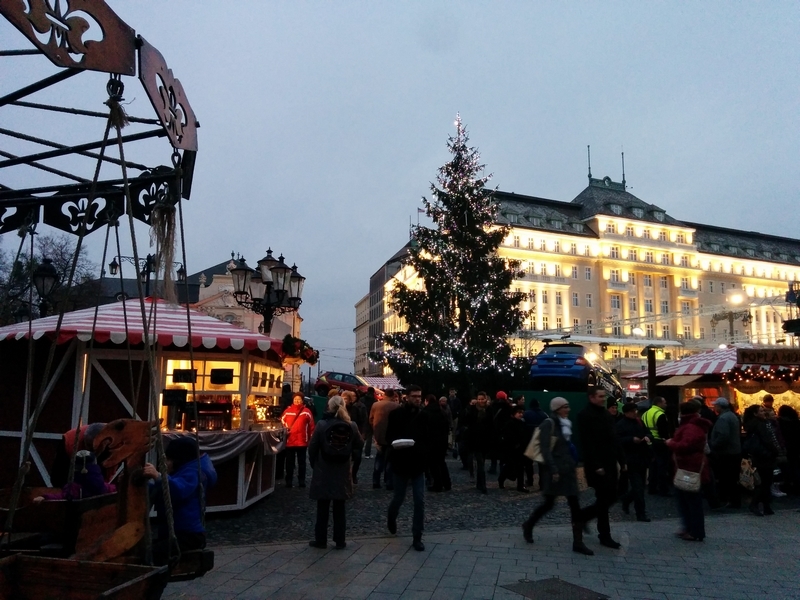 It is kind of obvious that there is a Christmas market at the main square in Bratislava. After all it is the main square, so this is where things happen! At this square you will be able to enjoy beautiful lights in the evenings and quite a lot of stands from where you can buy apples with sugar on the outside, chimney cakes, strudels, strawberries covered with chocolate, pancakes of many sorts and of course some more serious meat, sausages and other main courses. In addition you will find lots of handicraft made in Slovakia on the stands, meaning that you can buy some souvenirs and Christmas gifts with you home from Bratislava as you visit the market. At this market you will also find a big stage at which there are cultural programs, concerts and live music taking place quite frequently during the Christmas market. This is just two blocks away from the main square and this is one of the nicest and most famous squares in all of Slovakia. At this square you can find the Slovak National Theatre, the very nice Radisson Blu Carlton hotel, the American Embassy and quite some nice restaurants. There is also a small playground and lots of benches on which you can sit down and relax here. At this square George Bush held a big speech back in 2005. 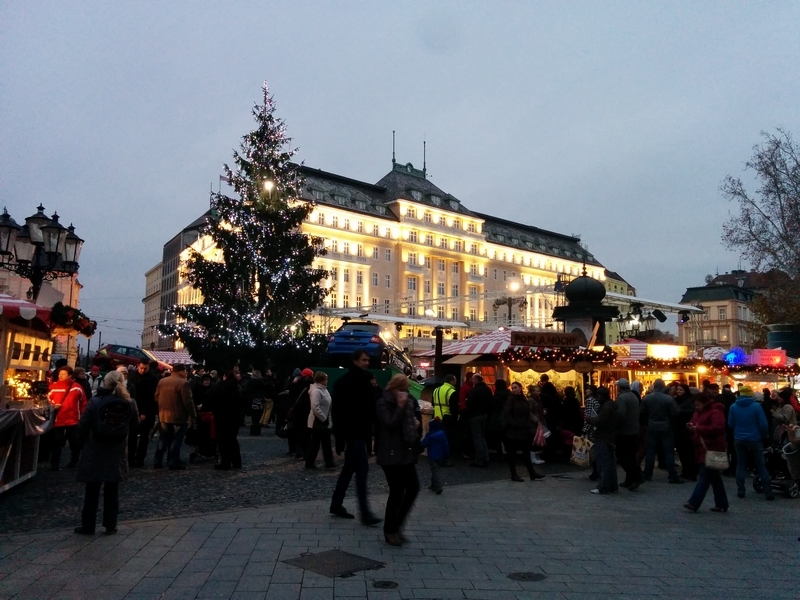 The Christmas Market located at this square is also magnificent, and especially in the evening. 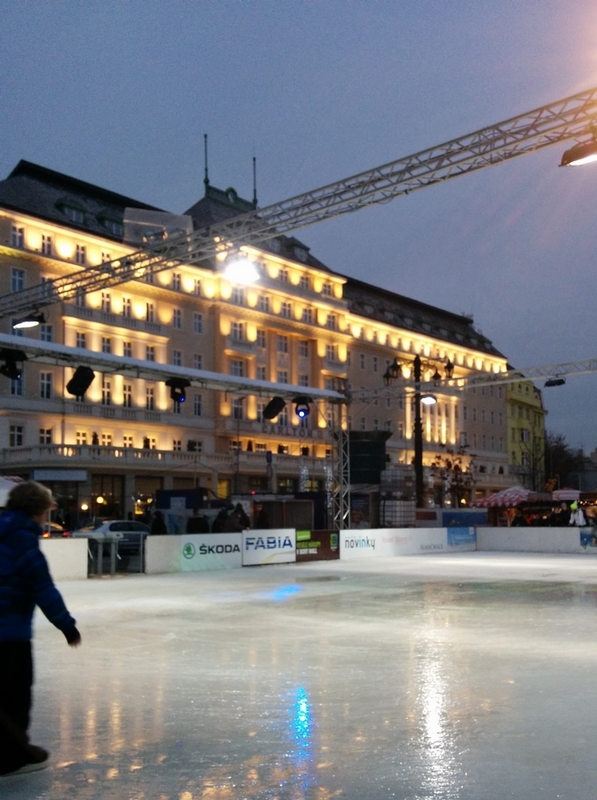 Here you will find an ice skating rink, lots of stands from where you can buy something to eat and drink, and a few stands where you can buy hand made objects and souvenirs. But, this market is first of all about eating and drink. For more information on what is going on in Bratislava, click the link.